This was a singing event featuring several minor idols, featuring songs of 80's and 90's idols. I went to see Itou Asuka. I arrived around 19:45, and the first performer was on the stage. There were around 30 people in the crowd. Asuka's stage started at around 19:50, and she was wearing a green yukata. 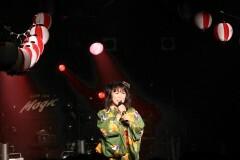 All of the performers wore yukatas for this event. Asuka's stage lasted for around 20 minutes, and she sang four songs. At the end of the event, all of the performers sang "Natsumatsuri". After the event, all of the performers sold some goods. Asuka sold individual photos for 100 yen each. It was a mix of old photos (from around 5 years ago), and recent photos. I used my 20D and 70-200mm F2.8L, and took 1117 photos (ISO800), with 323 of them worth keeping. Photos without flash allowed. Video, audio recording not allowed.